Last night’s PowerPoint presentation was a disaster. How is it that the technology always works smoothly at home, but when you set up your laptop in front of a hundred people, plug in the HDMI cable, and press the start button everything goes awry? I don’t know how, but I know that’s what happened last night as I tried to inspire a hundred people to start a hundred new small groups in the next 18 months. So, here’s the link to my PowerPoint presentation in the hope that they and others can see it as it was meant to be seen. For best results click the link, let the PowerPoint presentation download (you might find it at the bottom of your screen), click on the download, let the PowerPoint program open up, click on the “Slide Show” feature, and then push “Play from Beginning.” See if that works, and if not, let me know. 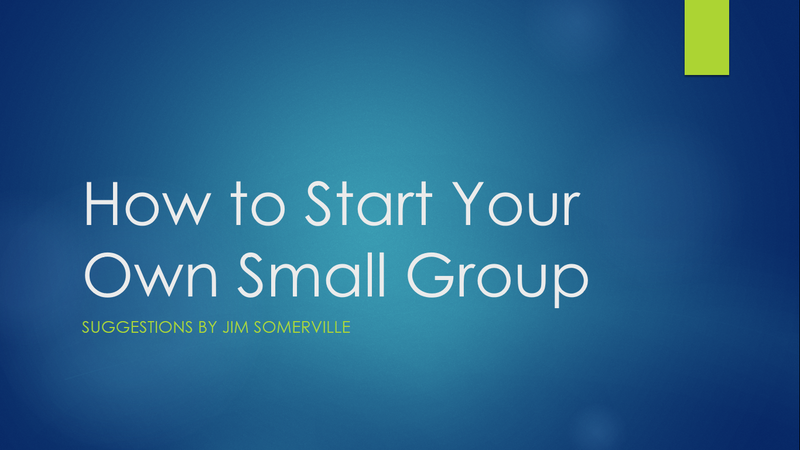 I hope you will take a look, and learn, and perhaps be inspired to start a small group of your own, whether it’s here in Richmond or on the other side of the world. And may your technology never fail.